Red Army team with the Soviet Union. stood up to a powerful system and paved the way for change for generations of Russians. 2012 by the National Board of Review. and his family. Gabe was kind enough to sit down with Following Films to discuss his latest film that hits theaters this Friday January 23rd. Thank you so much for doing this, I really loved the film. Of course, thank you for your support of the movie. To be honest I was surprised by how much I enjoyed the film. I don't really follow sports but the film absolutely worked for me. Even a layman like me is familiar with the 1980 "miracle" at the Lake Placid Olympics, but I had never considered anything other than the American point of view. 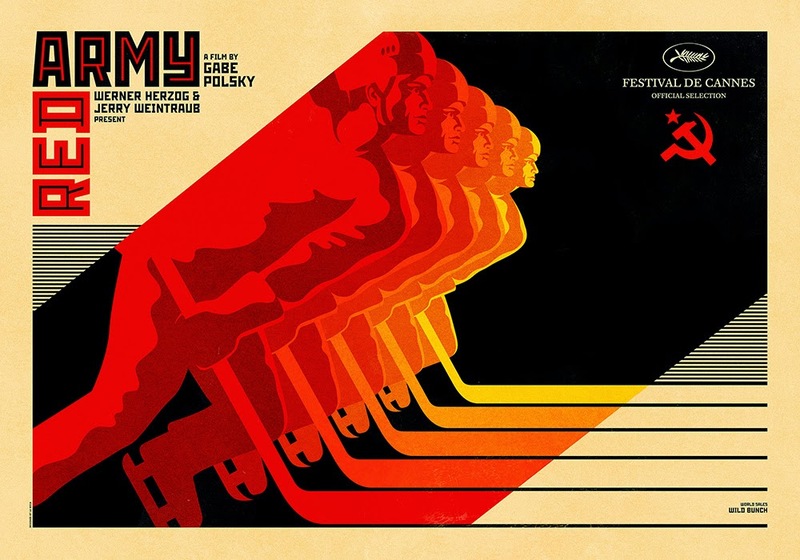 The film explores the Soviet side of 1980s hockey. What inspired you to tell that side of the story? Growing up in the United States and playing hockey as a kid, I was very familiar with the "miracle" on ice but when I was about 14 years old I got my hands on a VHS of the Soviet Union playing hockey and it blew my mind. I couldn't believe how amazing and creative they were. It was the dynamic plays were. It was like discovering John Steinbeck and he was unknown. It felt like this whole generation of Soviet hockey players were being ignored by most people in North America. All they new was the "miracle" on ice. The general audience that is, the real hockey aficionados would know but most people had no idea. You would talk to people about Soviet hockey and they say (dismissively) "oh yeah, miracle on ice." It seemed almost bad or at the very least unfair. What they did for sport and for hockey was a revolution. The created the great things that we love about sports. And maybe because it was the Soviet Union nobody felt like they needed to pay respect. The film successfully conveys the "language" of hockey.Were you conscious of making sure people like me could follow the film and hockey experts would be entertained? Most people who see the film are not hockey fans and they're the ones who come up to me afterwards and say "I never liked hockey" like the same thing you were saying but "now I have a respect" for hockey and this story. When you see something beautiful like a sunset or a flower its self evident. Whether its hockey or music or whatever you can understand what true mastery is without having studied it. Do you understand what I mean? Yeah, you don't have to be musically trained to understand when something is off key. Exactly. But beyond that hockey is really just a small aspect of the story. Its really just a window into this bigger story about the Soviet Union, about the rise and fall, about the friendships, the betrayal, the lives these players lived and the price that was payed for greatness. That's what the film is really about. Its more about how sports can be a creative expression and how it can be looked at as an art form. That applies to more than just sport. The more you apply other things to your field the greater it becomes. You have to be creative at any field that you are involved in. It goes beyond sports. You have to be dedicated. I think these guys went a little bit overboard and their human rights were violated. These players were clearly pushed too far by their coach. When you had a Soviet coach in your youth did you notice any similarities in his coaching style? Well you can't do those kinds of things in the US. But in the Soviet Union the culture was such that anyone who played sports at that time was treated that way. It was a cultural thing. It was the mentality of the people and the leaders that were there. It was a microcosm of that old Soviet mentality. That was one of the brilliant things about the film, it draws a connection between the people who were raised under that regime and the people who are currently in charge of Russia. That mentality is still all over there. All of these leaders have grown up in it and its all they know. You can't just outright change your personality. It takes generations to undergo a massive change. The thing is though we are all human beings and it doesn't matter if you are Soviet or African or wherever, we all have the same tendencies, the same emotions and the same struggles its just we have them in different systems. Were not that much different it really just comes down to the systems we live in. Slava can be quite funny at times in the film but seems like he would have been a difficult interview subject. Was he as hard to interview as it appears and how did you eventually get him to open up? He was very difficult, but you have to keep in mind that he has led a very difficult life. He's also a man that doesn't have much time. Thank god he gave me the interview but he's not the type of person that respects someone as soon as he sees them. You have to earn his trust and at first he just saw me as this young guy. At first he didn't know how familiar I was with their story. He saw me as this American guy who was coming in and he assumed my only angle would be the "miracle" on ice. He thought "what does he know about the Soviet Union, what does he know about hockey?" "He doesn't know anything." But pretty soon he realized I was looking for something much deeper. He saw that I understood their story. One of the reasons he is such an interesting character in the film is that he is just an interesting guy, he has a fascinating story but he is just a great character and a big part of what makes the film successful. I don't really like movies that are just one tone. I like to add touches of humor, excitement, drama wherever I can. I think that makes a good filmmaker, the ability to keep the film dynamic. When you show a Soviet players reaction to the loss at the 1980 Olympics, my wife said "I hope the Americans don't win." That's a common reaction to that scene. That's really what filmmaking is, creating empathy for people that you really don't expect to have it for. You have respect for these men when you see what they achieved, but when you see the conditions under which they achieved them you can't help but have empathy. Do you see this film as an examination of Soviet culture beyond athletics? My parents are immigrants from Russia but they hated it, they left. It was a very difficult place to live. It was a very hard life. They were very open and honest about it, but there was a different value system. It wasn't about the individual. It was about serving your country and working collectively, serving the greater good. Its an admirable quality but as a system it doesn't really work. You have to value the individual as well. In this case they created something beautiful through their hockey. That's one of the things about a totalitarian system, you don't have people telling you that you've gone too far. There are no checks and balances, you can pour all your resources into something and get it done. Whereas when you live in a democratic society it takes a lot longer for things to get done. That's one advantage but there are many disadvantages too. RED ARMY was easily one of the best documentaries I've seen in years and it opens in theaters Friday January 23rd.